Beveled clear jade glass award with metal peg for standing. 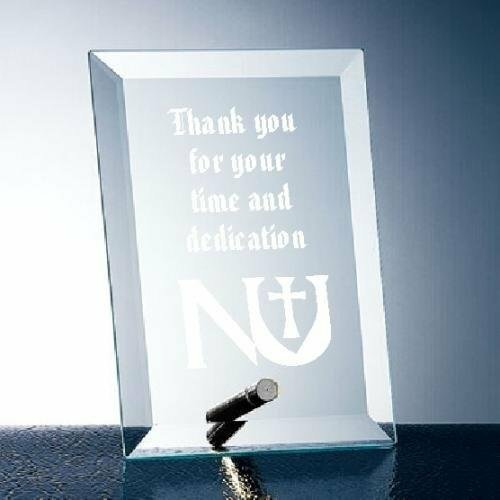 Your text / graphic laser engraved a frosted white. Individually boxed. 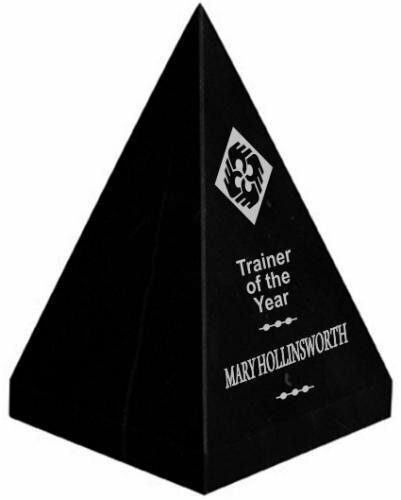 Pyramid-shaped black genuine marble award. One side is laser engraved with frosted white text. Individually boxed. Acknowledge effort and dedication with our mid-range plaques. An excellent choice for teacher appreciation, sports awards or employee of the month. Each wood-look plaque is double-plated, providing a rich border for the engraved plate. Add a graphic or corporate logo to make it your own. Available in 7 sizes, 5"x7 up to 12"x15"
Included in price are 2 minor text changes per plaque (such as changing a name and a title). 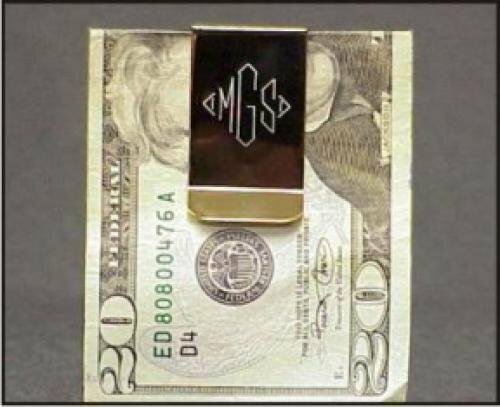 Keep your money neatly tucked away with a metal money clip. Engraved with your monogram, it is the perfect way to lay claim to your cash. $20 bill inserted for an additional $20. 2" x 7/8" x 1/4"
If wanting a monogram, please select Helvetica font and put the word "Monogram" in special instructions. Type the initials in the order you'd like them engraved (such as MGS for the sample shown). 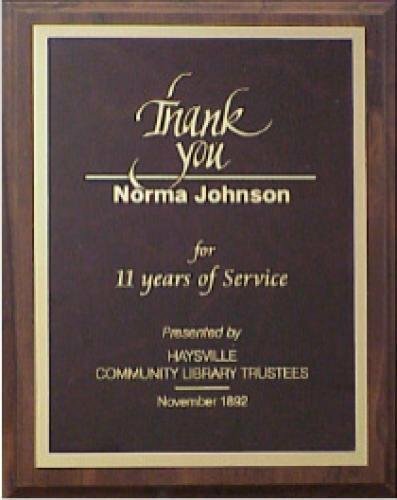 A quality American walnut plaque has 1" beveled edges and antiqued metal 3D torch attached. The engraved metal plate is black with a gold border. Your text engraves gold. This wood-look plaque will encourage and congratulate your champion employees and team members. Individual plates are 7/8" x 2-3/4". Small individual plates returned for engraving later are billed at that time. For reference, our current price for engraving these returned plates is $5.50 each. That price includes up to 6 words. This real American Walnut perpetual plaque records the accomplishments of outstanding achievers. The gold-edged 7/8" x 2-3/4" brass plates highlight those achievements. This cherry-look perpetual plaque is our most affordable. The 1" x 2-5/8" small individual plates are added as the people's names are known. Small individual plates ordered later are billed at that time. For reference, our current price for these additional plates is $5.50 each. That price includes up to 6 words.